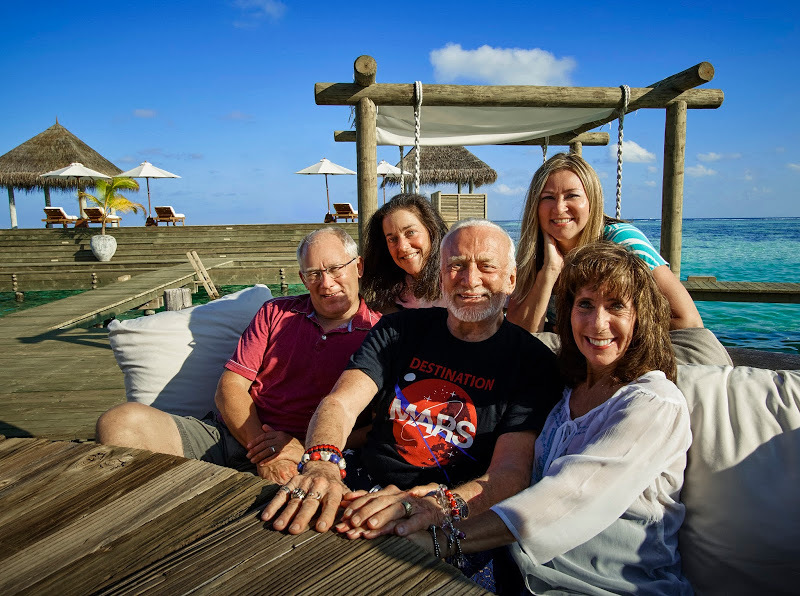 Buzz Aldrin, one of the first two men to walk on the moon in 1969, was the first guest to stay at Gili Lankanfushi’s newly upgraded Private Reserve, the largest overwater villa in the world, when he visited with his family last month. A big fan of space, the sprawling 1,700 square meter villa was the perfect choice for the Aldrin clan, offering a vast all-natural, luxury hideaway, surrounded by the Indian Ocean. Standing alone in the middle of the sparkling lagoon, 500 metres from the resort and accessible only by boat, the Private Reserve offers total privacy for those seeking respite from the limelight. The nearest villas are 300 metres away, guaranteeing total seclusion, while the incredible master suite offers guests further privacy within the villa itself. Built of wood and glass and sleeping up to 12 people, the three-bedroom Private Reserve is cleverly designed to give families and groups of friends ample indoor and outdoor living space to relax and share quality time together in idyllic surrounds. A new 63-metre freshwater swimming pool overlooks the lagoon, with jacuzzi and sun-decks, while a water slide from the top deck into the lagoon adds to the fun. To ensure guests’ every need is met, the Private Reserve has two personal Mr Friday butlers on hand 24/7 (who can live-in if required). Meals are created to specific tastes by a personal chef using the very freshest ingredients and produce from the resort’s organic vegetable and herb gardens and fish caught daily by pole and line in the lagoon and all washed down with the vast selection of organic wines. A private spa with sauna and steam room, gym and state-of-the-art cinema save guests from needing to venture out if desired. For those wanting to explore beyond the villa, some of the best diving in the world is literally lapping at your toes and the resort’s Ocean Paradise Dive Centre offers unforgettable underwater experiences with expert instructors. According to Buzz, scuba diving is the closest thing to being in space. While the facilities of the resort – named the Best Hotel in the World by TripAdvisor in the Traveller’s Choice Awards 2015 – are just a short boat-ride away, the Private Reserve offers the ultimate in privacy and luxury. A truly special place that no guest wants to leave. Buzz was photographed by French photographer Cyril Mason, renowned for taking iconic photos of the world’s greatest sports people and adventurers.